Wowee!!! I have been dying to share this pattern I tested leading into Spring break. 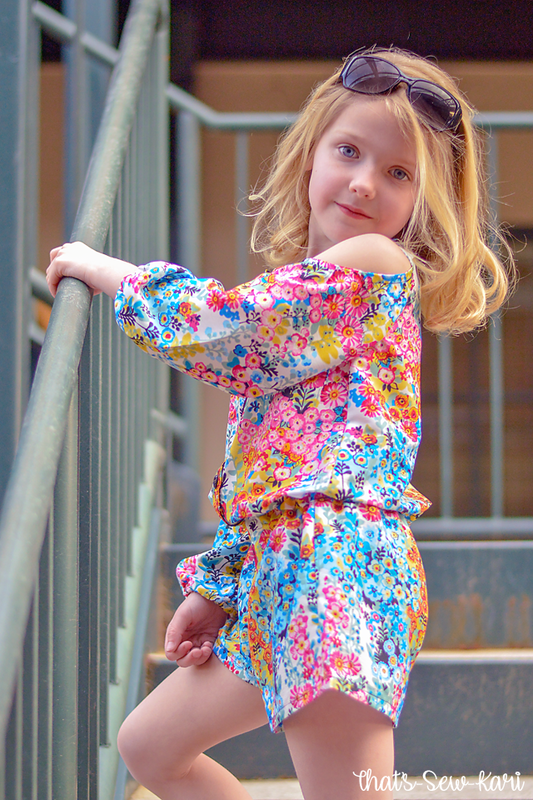 The Monterey Romper by Little Lizard King is the second pattern Molly has added (see her 1st here) and I am in love!! 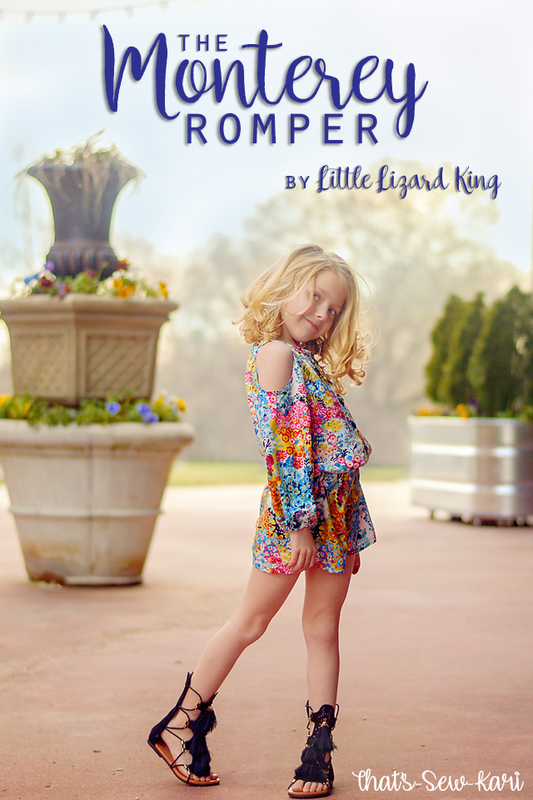 This modern romper is designed for lightweight fabrics such as voile, lawn, rayon and other apparel fabrics with nice drape. It covers sizes 12m - 14 which is a nice range. 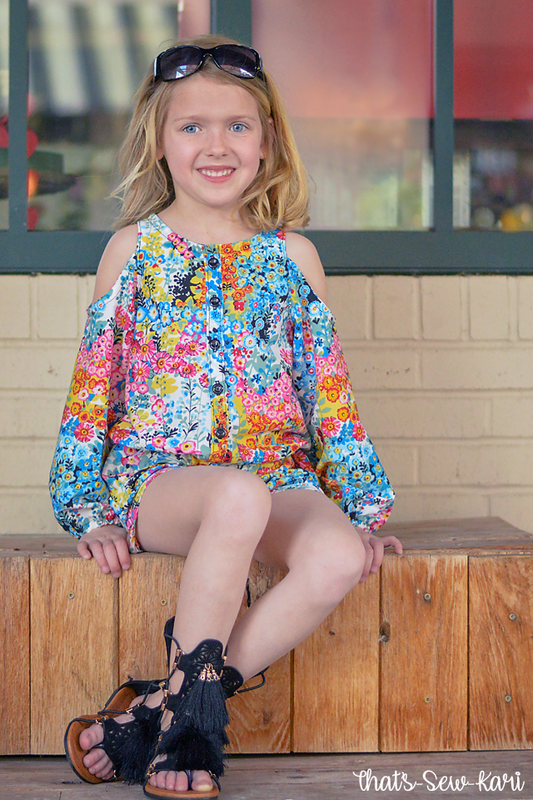 Options include sleeveless, cold shoulder or split shoulder in three sleeve lengths, and closed shoulder in three sleeve lengths. There are also optional pockets!! I found this stunning floral polyester at Hobby Lobby which had just enough black in it to match my daughter's new shoes. The ensemble is unlined and finished with bias facings. The button placket is a great way to add a pop of color, if desired. The reason you'll want to select a fabric with nice drape is to get this airy, bloused effect at the waist. Because this fabric is a little trickier to work with, plan on spending a little more time sewing it together. Also, double check the iron temperature so you don't accidentally scorch or melt your fabric. I found that I could use a higher temperature if I placed a normal piece of quilting cotton on top. This came in handy when I was pressing the hems in place. As you know, my girls do not fall in standard sizing. One of my favorite things about testing is seeing how easy it is to blend the sizes to fit the measurements of my girls. This way, the finished look is how the designer intended it to fit and my daughters get a perfectly tailored piece of clothing which is impossible to buy from a store. For this pattern, my 7 year old is wearing a size 3 chest, 2 waist (elastic measurement), 4 hip, and a 6 length. Whew, that was a mouthful. Tip: The width of the waist needs to match on both the bodice and the shorts when sewing together. I sewed the width of a size 4 on the shorts portion in order to fit her hips and because the waist is cinched with elastic, the bottom of my bodice is graded out to a 4. So if you are blending sizes, double check this! The side seams of the bodice are angled outward so when I originally followed the angle down to a 6 length, I actually had increased the width of the waist of the size 3 chest accidentally. I only had to add about 1/8" to get to the size 4 waist. The cold shoulder is one of my daughter's favorite features. I think it makes her feel sophisticated and trendy. I love it because I can actually sew them items that they see in the store (that don't fit them). Gone is my little baby and in her place is a stunning young lady. 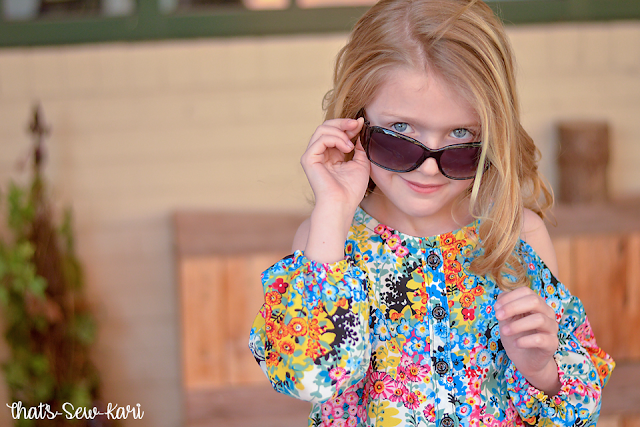 One of my favorite byproducts of sewing is watching her grow up in front of the camera lens.